I've made reference to this site before in other threads. The parcel in question is at 155 E. Michigan Ave. downtown across from the Radisson. The site has a been a parking lot for a long as I can remember as well as Transit change-place and a key stop on the Holly Jolly Trolley. It basically sits directly at the heart of downtown Kalamazoo. With such prime, visible real estate I can't possibly believe it's more valuable as a parking lot. I checked the city of Kalamazoo's website and the property is apparently owned by Continental Corp. or Michigan, a holdings subsidiary of Gilmore Enterprises. I tried to go to their website (as I have tried on several different occasions before) but it's always been under construction, I have no idea how to contact these people. It is a substantial piece of property too and as far as I can tell the parcel, while treated as a single entity is actually subdivided into several lots facing Michigan Ave. (subdivided rather like stores on Burdick). As far as future development goes I assume we wouldn't want anything taller than 3-4 stories so as not to cover up the historic "Kalamazoo Building" sign or windows underneath. Indeed that building seems to have the outline of its previous neighbor imprinted on its side. Who knows the history of this location? What building stood there before? Why has it not been targeted for development? How can we get in touch with Gilmore Enterprises? If it were developed what should go there? I'm sorry I can't answer your questions, but I have noticed this parking lot the time I've been in Kalamazoo as well. It is sad that such a key piece of land is being used as a surface parking lot. If This land was developed I think it could be done taller than 3-4 stories without covering the Kalamazoo Building sign. The middle of the block could be that hight, but I think a larger tower would be nice at the intersection so you would still be able to see the sign from the angle this photo was taken. Or have a building at with a streetlevel presence for a few stories (perhaps a parking structure with ground level retail along Michigan), and then have a taller building on the back half of the lot. What does the Gilmore company use this lot for? Is it a pay lot, or is it used by one of the nighboring buildings? The lot is currently a private pay lot - Mid-Town Parking. I don't know whether one of the surrounding buildings has an agreement. As I recall, the lot was used up until recently as a bus transfer area. It was my undertanding that the renovation/construction of the new Kalamazoo Transportation Center and the consolidation of bus transfers to that location would free up this lot for development. Not sure what the status is now but its certainly the most visible and obvious development opportunity in downtown Kalamazoo. I think the bus transfers took place on Michigan Ave though with long lines of buses on the streets on both sides of Rose, both in front of the parking lot and in front of the County Building. I wish I had a collection of old postcards looking right up Michigan Ave at this spot. Then I'm not even sure I'd recognize it. Right now, this lot is fully packed everyday for what I believe are tenants at the Commerica Building. Sadly, they even make enough money to have the lot resurfaced every Summer. I agree, the best bet would be to have 3-4 floors of parking on the site with a taller tower on top of the parking but only on the south half of the site as to not cover the Kalamazoo Building. With a floor or two of underground parking as well, hopefully there would be enough left over for surrounding building tenants. Most importantly, some ground level retail could be snuck onto the corner of Rose and Michigan ave....taking full advantage of such a busy area. By the way, here is what was on the lot before. I think I remember hearing that these buildings burnt down in the 70's. 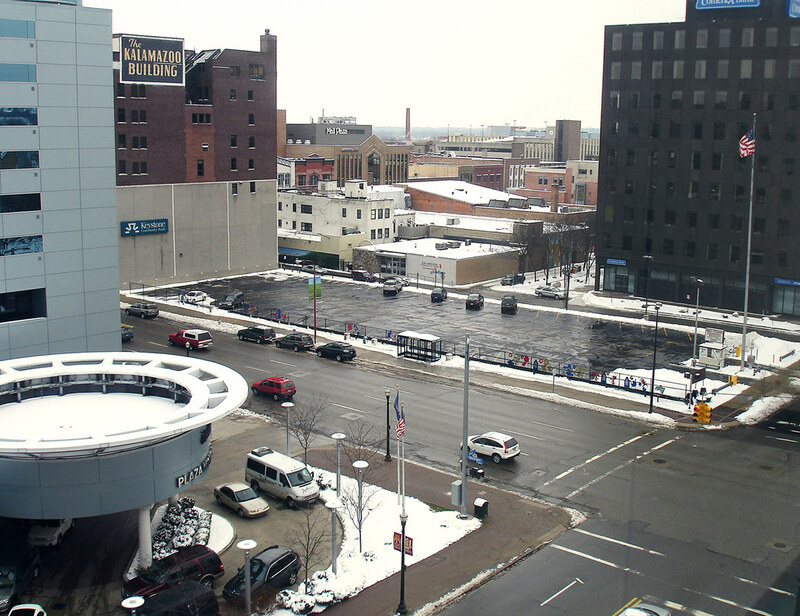 This comes from http://www.builtkalamazoo.com/index.html which I noticed posted from Waldo in the Miller-Canfield thread. 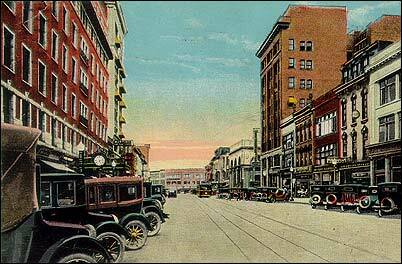 The buildings on the left is now the Radisson and of course the tall one on the right is the Kalamazoo Building. I remember the fire and it seems it was in the early to mid 1960's, and a big one at that. One of the buildings housed a music store that sold records. I always thought it would make a nice park with a fountain in the summer and a ice rink in the winter. Of course that wouldn't bring in any bucks, so that will never happen.